Attention: With start of 2012, these pages will be updated again. Updates will come for the section "Motorcycling in Sweden". There will be better maps and new routes. The overview-maps of the roads in Örebro Län end of the favorite roads have gone "online". The next updates will be on detail level. With a lot of efforts, the "motorcycle-friendly roads in Örebro Län" have been published. An overview-map will follow. All new maps are uploaded. Additions and improvements will follow. The new maps to the road descriptions are slowly coming up. The material comes from a test-series, which was made for the SMC district Örebro län from 2009 to 2010, and will be improved. 2005-05-13 New: Sights in Sweden: Industrial Landscape Norrköping. 2004-12-22 New: The description of the sweden-journey (2002) of the Feuerwehrbikers from Ohne is now also completely available in English. See under Activities 2002 and Motorcykling in Sweden. The pages do not yet include photo-titles. 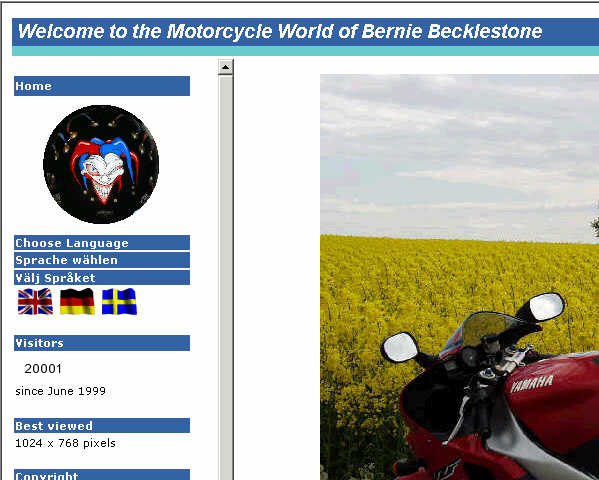 2004-11-24 New: The "Motorcycle World of Bernie Becklestone" had its 25000th visitor on november, 24, 2004. 2004-10-21 New: The report on the 4th DMV-Franken-Trophy was started. See Trophy-World and Activities 2004. In the funny-section you will find something about human manners (german only). 2004-07-08 New: The description of the Sweden-journey (2002) of the firebrigade-motorcyclists from Ohne ist now online (German for now). See under activities 2002 and Motorcycling in Sweden. The pages At The Races of the SMC Nationals are now online in English and Swedish. The pages about the beauty contest People's Choice during the SMC Nationals are now online in English and Swedish. The pages about the Orientation Ride Kilsbergen Runt during the SMC Nationals are now online in English and Swedish. Orientiation Ride Kilsbergen Runt with Roadbook. At-The-Races - Experience the Scandinavian Open. People's Choice - Beauty contest for visitor's bikes. The report starts with Touroverview. 2004-02-12 New: The report about the Franken-Trophy 2003 was commenced. See under activities 2003. After 5 years and 51585 kilometers my r1 is leaving me. 2003-10-09 Attention: The site had its 20000. visitor today. The webmaster came one hit too late and was visitor 20001. 2002-11-14 Attention! 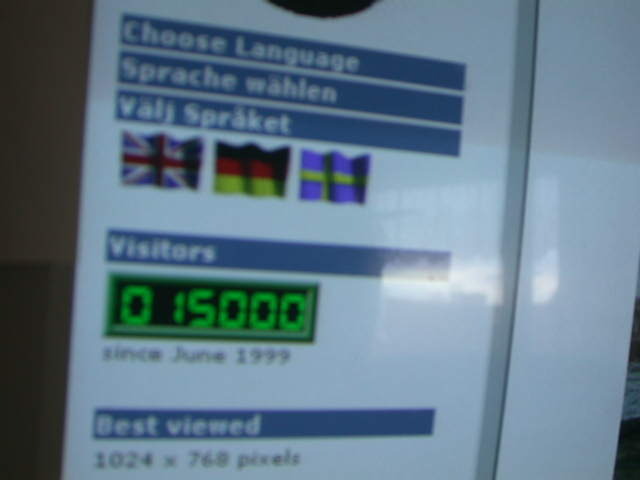 The 15000th visitor was "Onkel" from Germany. 2001-12-05 Attention! The 10000th visitor of this site was from Norway.